The ELD 50® is an electronic logging device that plugs right into the diagnostic port below your dash. That’s it-no other installation needed. With an reasonably priced monthly service plan, viewing and certifying HOS logs is a snap. Through a Bluetooth® connection, the ELD 50® will upload your entire logs into the free Rand McNally DriverConnect app- to be had for the TNDTM Tablet or other AndroidTM device. 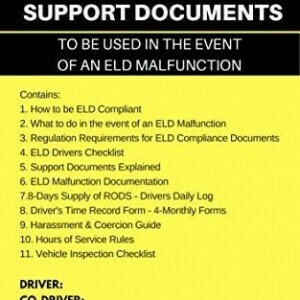 * If you lose connectivity or wouldn’t have your mobile device, ELD 50® will continue to record your HOS logs and store up to 2 days’ worth of data. Sound alerts allow you to know when the ELD 50® is at capacity and it is time to sync with your tablet or phone. Compliance simplified, secured and solved. The ELD 50 is an reasonably priced electronic logging device that’s easy to install. Download the free Rand McNally DriverConnect app for Android and pair with the ELD 50 to certify logs, view timers and check key engine stats. A web portal routinely stores 6 months of log history for simple get admission to. Patent Pending. Adds E-Logs to Your Android Device, Plug In, Pair and Go! Would possibly not work with older Android devices.